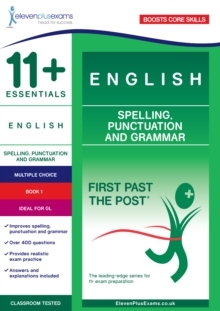 Knowledge of spelling, punctuation and grammar is at the heart of 11 plus and Common Entrance exams, such as those set by Granada Learning (GL). The questions in this book have been designed to replicate the last three sections of the current GL 11 plus English test. There are three topic-based chapters, each of which contains a total of 15 exercises and focuses on one of spelling, punctuation or grammar. At the end of the book, there are three mixed tests, each of which contains three exercises and is designed to provide timed practice. Each chapter and test contains a range of text styles: classic fiction, contemporary fiction and non-fiction. Extensively road-tested by the Eleven Plus Exams centre, all First Past the Post 11+ Essentials books are perfect for use both in the classroom and at home.